Humphrey Bogart may be the most well-known and revered actor in American film history, but in his illustrious career he only won one Academy Award. Some might say he was a “popular” actor but not necessarily a great actor — to them I say phooey! He starred in one of my top 10 favorite films of all time — Casablanca — and his portrayal of Rick Blaine has been immortalized. Throw in memorable roles in The Treasure of the Sierra Madre, The Big Sleep, The Maltese Falcon, Key Largo…and on and on…he is one of the greatest actors ever. It seems strange then that he finally won an Oscar for playing a drunk and none too bright boat captain in The African Queen, made just a few years before his early death at age 58. For co-star Katharine Hepburn, her portrayal as the tightly wound church spinster Rose Sayer was one of her least rewarded roles, having won four Best Actress Oscars in her career (On Golden Pond, The Lion in Winter, Guess Who’s Coming to Dinner, Morning Glory). She did get nominated for The African Queen but lost the Best Actress nod to Vivien Leigh in A Streetcar Named Desire. By the way, for my money Ms. Hepburn was never better than in The Philadelphia Story, another of my all-time top 10 favorites. 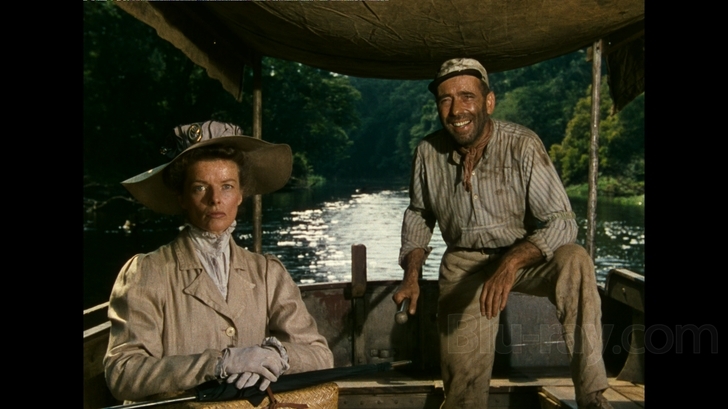 For me The African Queen is simply a vehicle for the two greatest actors of their generation. To be honest, if the film starred anyone else it wouldn’t have made the cut. It’s a bit corny and unbelievable and both Bogart and Hepburn are past their respective primes. But it’s Bogie and Hepburn so you have to forgive the silly plot and the ridiculous love story. What makes the film great is the play between the two icons — they each play over-the-top characters and together they make the film worthwhile. In fact, there are very few scenes in the film that are not simply Bogart and Hepburn together. There are only nine other actors credited for acting in the film! The rest are African extras.